In large organizations, it can be challenging for teams to learn from each other on a regular basis. This is often due to siloed information which reduces opportunities for knowledge sharing and innovation—a recent study shows that 65 percent of executives name “silos” as one of the biggest obstacles in cross-departmental collaboration. In G Suite, we look to remove these blockers so you can focus on impactful work no matter your location. One of the ways we help businesses share information is through Google+ for enterprises. 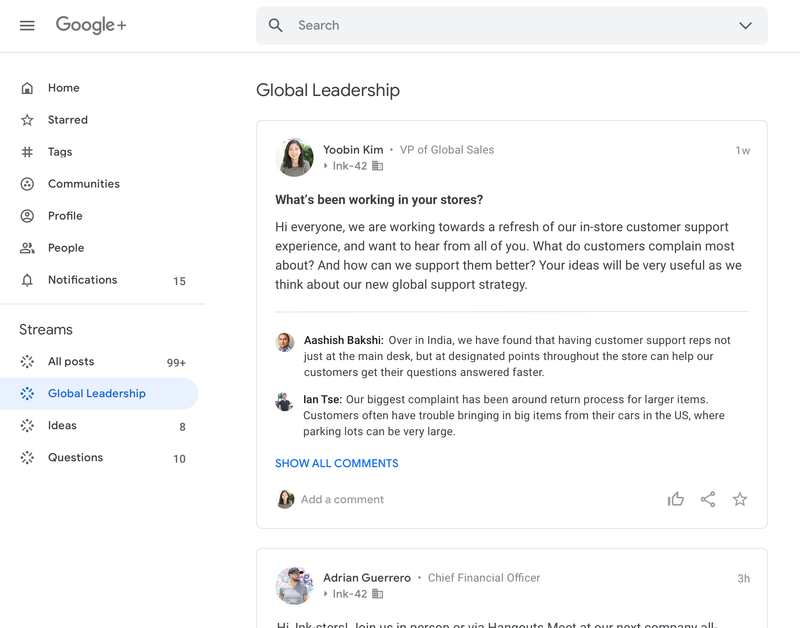 G Suite customers like Nielsen and Auchan are already sharing information across their organizations using Google+, and over the past year, we’ve been building a new experience that’s designed specifically to meet the needs of large organizations with distributed workforces. Today, we want to share a sneak-peek into our new direction for Google+. We know that communication platforms require oversight in large organizations, so we’ve made sure that Google+ has the same simple enterprise-grade manageability as the rest of G Suite. 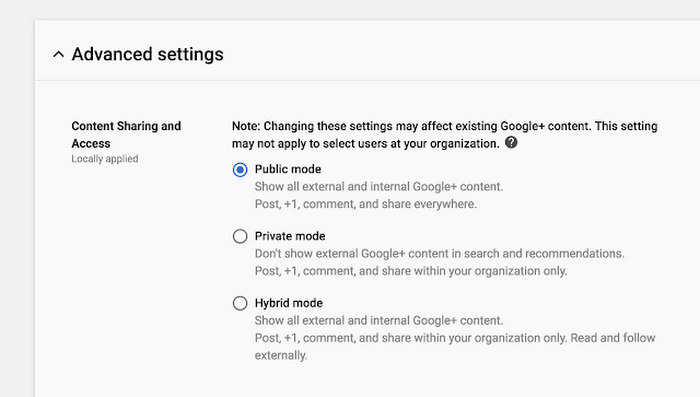 Last year, we gave G Suite admins the ability to define permissions in Google+ around sharing information outside of an organization which makes it easy to create internal-only networks. More recently, we added the ability to bulk-add entire Groups to a Google+ community to make it easier for admins to onboard users. Once employees are using Google+, admins can also view engagement metrics for Google+ communities owned by employees. Soon, we'll be adding additional capabilities for admins to be able to review and moderate posts made by employees, if needed. We want to make it easier for all employees to engage in conversations across their organization, including deskless workers who want to stay engaged on-the-go outside of email or chat threads. As a part of our new posting experience for Google+ in G Suite, employees will be able to direct and discover content in a new way—tags. Even if you don’t know all employees across an organization, tags makes it easier to route content to the right folks. Soon you’ll be able to draft posts and see suggested tags, like #research or #customer-insights when posting customer survey results. This helps content surface to employees that follow that tag, and they can choose to engage when it’s convenient to find new ideas or join relevant discussions from across the company. Another benefit of Google+ is that executives can engage in two-way conversation with employees at all levels of an organization—this way they can keep a pulse on employee discussions and improve company culture through more free-flowing ideas. Soon, admins will be able to define custom streams that allow employees to receive topical communications. For example, a custom stream for “Global Leadership” could include all communications from executives and allow employees to engage in discussions with leadership directly through posts. Additionally, for customers who store reporting structure in G Suite, we will provide post analytics so individuals can see how their content is being viewed by functions across an organization, like product or sales teams. We are excited to see how businesses continue to use Google+ to transcend silos. Stay tuned for these new features coming in 2019!